Fabrication of the Duke City Pedaler is complete! Atek Customs in Kingman, Arizona, has finished the first "party bike" in New Mexico. The vehicle is equipped with an electric motor assist, rack and pinion steering, LED headlights, safety lights and hydraulic disc brakes. 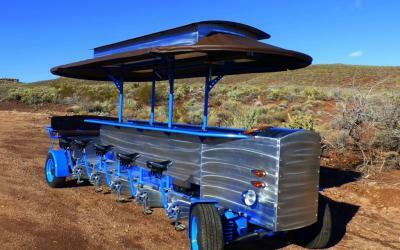 In keeping with ABQ Trolley Co.'s commitment to "uniquely-Albuquerque" design, the custom made Pedaler is the first party bike fabricated with a "hot rod" front end, a detail reminiscent of the Duke City's Route 66 heritage.